Why do donkeys sound different to horses? My question is, why do donkeys hee-haw when horses bray? And what sound does a zebra make? Alban - So to this question, I really can't say because there's just very few work done on equine vocal communications. The only thing we know is from horses. We don't know anything between mules and donkeys, or zebras for instance. My only experience is when I was working in the fields, I often listened to zebras and it sounds like in between mules and horses. But we really don't know this has to be studied more systematically. It has something to do with phylogeny and anatomy. Diana - Believe it or not, no one has worked on comparing the noises of these animals properly. Alban suggested anatomy may play a role. So let's hear how different these noises are and here's a horse: A donkey: And a zebra: There is a sort of similarity between them all with both the zebra and the donkey doing that sort of hiccup with their braying. Now donkeys and zebras are thought to be more closely related. So it could be something the modern horse hasn't inherited, or they might differ because of the social organisation of their species. Horses actually have a number of different calls as Alban describes. Alban - They have a very small vocal repertoire of a few calls and one call is particularly interesting. It's the weenie call that we have studied more intensively and this is a particular call that they often produce when they are far from each other. So it's a kind of long distance contact call. So in order to be sure that this has a social function, we studied the acoustic structures of weenie calls to see if we can find acoustic differences between individuals. And we found that duration or frequency parameters change. For instance, you can have a much higher pitch voice in mares than in geldings which are also higher pitched than stallions. But it also depends on the social status of the animal because dominant stallions have a much lower pitch voice than subordinate stallions. Then finding these acoustic differences doesn't guarantee that the animals will use it, so we have conducted a playback experiment and we played the weenie calls of three social categories of horses, the familiar neighbours, familiar strangers, and group members and we found that our horses when hearing these three voices could discriminate the social category of the caller, and they adapted their behaviour response in accordance to the caller. They would be more attracted and willing to go towards the loud speaker for familiar animals, but they would be very vigilant and careful when hearing unfamiliar animals. So that gives us the conclusion that we found acoustic differences between individuals and these acoustic differences can be used by animals and decoded by animals. Diana - So if a horse has developed different calls for social encounters, perhaps the divergence in their societies has caused a divergence in their noises. We had one listener, Siobhan in Ireland, he wrote in to tell us about the breeding program in Russia to domesticate silver foxes. One of the notable developments was that they began to bark, they began to wine and they developed a more diverse range of vocal communication. 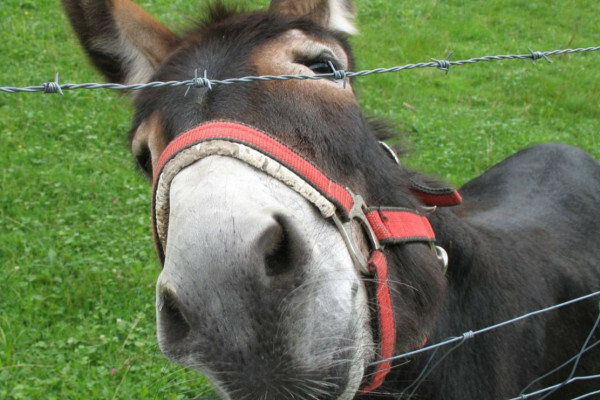 So, if we domesticate horses and donkeys on the basis of their ability to communicate just a bit with us, perhaps that's caused a change in their voices too. If anyone out there has cleaned out a stable, they'll know all about the smell of urine. But what if it smells of your last meal? Previous How are translocations related to cancers? Next Do airline pilots have more haemoglobin? Will mankind ever stop evolving?